Seventeen buses in the morning peak is about one every seven minutes. The most common of these will be the 95 frequent route. And here’s a bit more detail on exactly what’s proposed. So it’s strange then that the proposal has sparked National Party MP Dan Bidois to launch a petition calling for it to be stopped. His facebook page includes these videos. Now I get that changing the layout of streets can sometimes be controversial to locals, particularly introducing bus or transit lanes where they replace a general traffic lane. But here’s the thing with this proposal, the transit lane isn’t replacing any existing general traffic lanes, it’s being added in addition to what’s there currently simply by reallocating some of the existing road space. This can be seen in the image below looking north from Zion Rd. Everyone who currently drives won’t be any worse off by adding this lane and if you happen to carpool, you’d be better off. What’s not to like? As for Bidois’ contention that there’s no congestion, this photo provided to me seems to suggest there is at least some, this is also backed up by looking at Google’s traffic data showing traffic does slow down in the morning peak. I suspect that AT are being used as a convenient whipping boy by Bidois, perhaps trying to increase his profile. 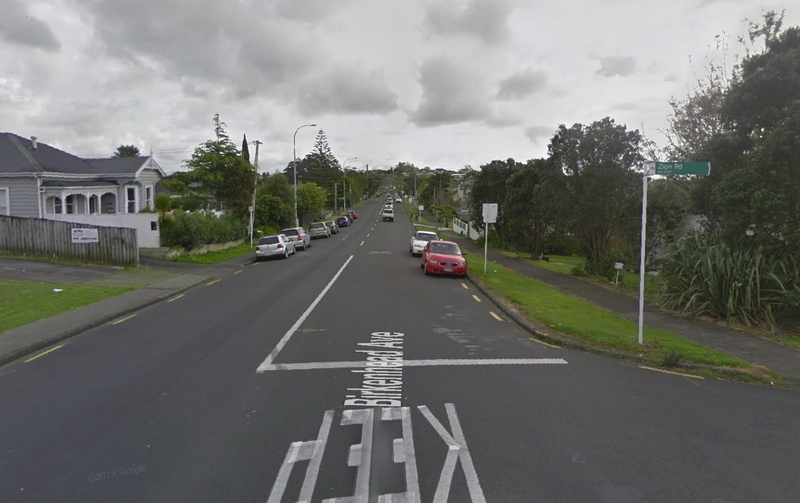 Is this the most important bus or transit lane in Auckland, probably not but it certainly looks like an easy one that can be done with no downsides. So, if you’ve got a few minutes spare, and especially if you use buses in this part of town, jump on over to the consultation and give some quick feedback in support. What’s not to like? zOMG I can’t park my car on the road anymore 24/7! It is pretty telling that a politician can get away with claiming there is no congestion on Birkenhead Avenue. I can regularly see the that queue going back all the way past Eskdale Road. The number is actually approximately one bus per 3.5 minutes. Birkenhead Village is a bit busier still but also has no bus lanes. You mean because the trip would take too long by public transport? Brilliant idea: How about we make the trip faster, by not requiring the buses to be stuck in the congestion caused by sov’s? D’uh! Bidois: There shouldn’t be a political division here. Resisting improvements to public transport is just backwards. It’s not right wing. It’s stupid. The National Party have to pick up their game. 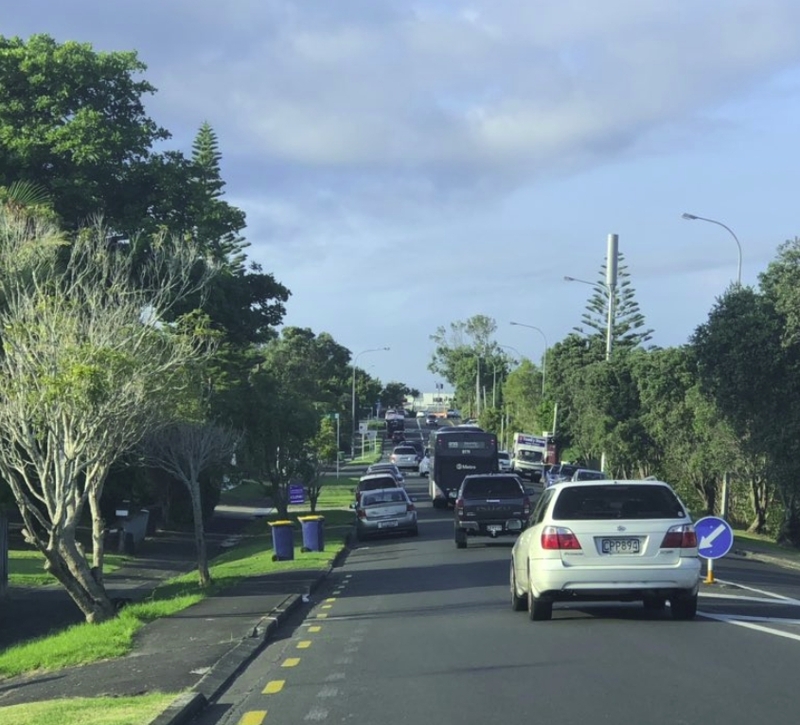 Aucklanders are sick of this congestion – they want alternatives, but while buses aren’t given priority, they’re not given any. Dan does have a point that AT could/should focus on the bigger issues in the area, like Onewa Rd itself. Onewa really is quite bad for all users at the moment, and not just at peak times. It’s a very odd way of making that point. If that’s the case he should be standing beside Onewa Rd with a loud-speaker complaining about the lack of enforcement of the T3 lane. Its not his main point, but reading through his facebook posts it’s about the only one that stands up to any scrutiny. I am a regular user Onewa road and I also uses Birkenhead ave often during morning rush hours. I can understand why local people are frustrated. The problem is the Onewa T3 lane appears empty because there is only a single bus every few minutes; where the vehicles on the car lane are moving at standstill speed. That makes car drivers angry because they see AT is ruining there lives. The current situation is a backslash of it. A large percentage of locals are frustrated and the local MP understands it and use this to get some supports. you have just described rapid transit. Empty bus lanes with buses whizzing past every minute =’s Rapuid Transit at work. Surely you just educate your electorate that 1 bus = 100 odd cars etc etc? Are residents of Northcote and Birkenhead different to everyone else who appear to be asking for more bus lanes and better PT? Don’t answer that…we all know the answer. The problem is AT stupidly allow parking on Onewa road, a single car parked will block the whole left lane. If there are also car turns right, the whole Onewa will be blocked. After 9am, the bus become offpeak and the bus lane becomes almost empty. However there are still a lot of cars moving in standstill speed waiting to be cleared. The bottleneck comes from the inefficient traffic light intersection around lake road/ queens st. That made worst when there is only a single lane for the whole area. 1. Ending the T3 lane at 9am but make the whole Onewa road non-parking will have a much better outcome. 2. Fix that inefficient traffic light intersection around lake road/ queens st by having a synchronized light phasing and ends the T3 lane just before that intersection. 3. In long term, dynamic lane for Onewa road is something worth looking at. Isn’t it amazing how perceptions can vary? Car drivers waiting in traffic for an extra 15 minutes see their life as being ruined. Inhabitants in Devonport, near Little Shoal Bay, and at Mission Bay see those car drivers and the emissions that they cause, day by day, that will eventually lead to the inundation of their properties and maybe think, my life is ruined. This comes up again and again, however, the evidence is the fact that the T3 lane carries 70% of people travelling down Onewa Rd. If you don’t want to be sitting in traffic, then stop being a part of it by driving. Regardless, the majority of people take advantage of the lane, the rest who for whatever reason refuse to, still end up with a faster journey as a result of the efficiency of the lane. Search back through here for the dozens of articles on this constant obsession with getting rid of the transit lane. hmmm – Does Bidois live in Onewa Rd? Certainly his car is frequently parked at the top of Onewa in the evenings. The telling clause of his FB post is over 50% of cars in the T3 Lane have less than 3 occupants I don’t doubt that this figure is accurate. Lack of proper enforcement is the real issue here Dan. Particularly in the evening when I have never seen a camera out and often see cars parked!!! in the T3. As someone who drives Onewa each day, as much as it pains me to say this, I agree with Dan’s opinion that over half the vehicles travelling down the T3 have less than 3 people in the vehicle. This is rabble rousing. Dan is searching for relevance and the boomers on the shore who love their cars are the perfect audience. Dan is someone who has publicly stated his admiration for the American healthcare system and we should be entirely user pays, which says enough about him… He’s pandering to his constituents. 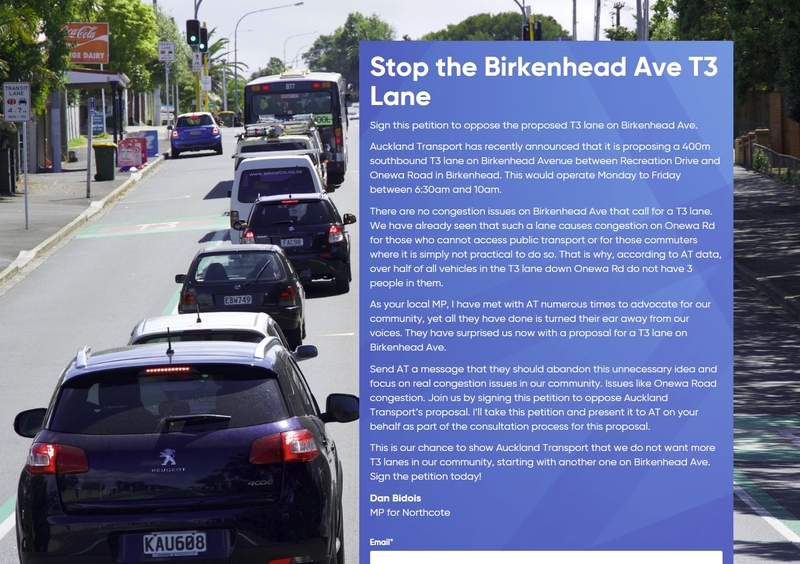 Yes give the buses a chance in a bus lane / T3 on Birkenhead Ave. 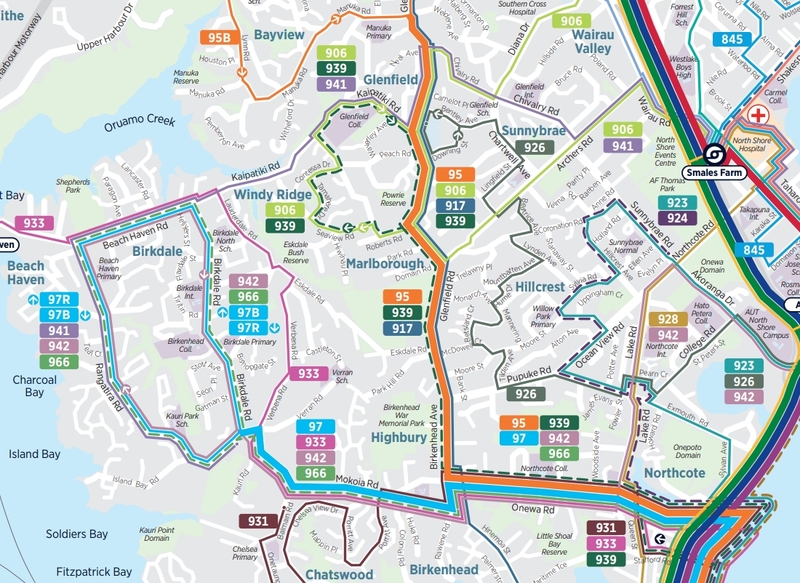 I struggle to understand the priorities of installing bus infrastructure, the Shore seems to have heaps of existing transit Lanes and bus lanes, as does the Itshmus and the Shore, even South has some as far south as Manurewa. Lincoln near Triangle Rd, only used by the 129 peak only route, arguably not very useful has the bus has to cut across two lanes to get to the correct side. NZTA bus lanes, Handy for the NW Motorway services, slightly token, in many cases the outer lane of traffic ends up catching up as the bus gets stuck at every on/off ramp, if the traffic isn’t moving at all (where you would think they would be most effective, the bus just gets stuck at the next on/off-ramp until traffic begins moving again). It is strange that NZTA is “forcing” infrastructure on the north, when the west has been very much asking for it for some time. Reminds me of the Devenport AT “uber” trial. Is this geographical privilege. Or does NZTA enjoy withholding from those that want, and putting upon those that don’t? Also I don’t actually believe that this Bidet guy represents too many humans, they are surely mor reasonable than that? It is weird, isn’t it? Yes it feels like the west is often forgotten about, like the world ends at New Lynn for AT. The inner NW gets some attention but not much either (upto Te Atatu and in the new development areas around Westgate and Hobsonville etc.). But most of the streetscapes in West have remained unchanged for decades, meanwhile areas in the Isthmus and the North Shore get upgraded multiple times over in the same place. Our bike lanes get forgotten about and roads resurfaced with the bike lanes missing, or they just fade away never getting repainted, or they are just filled with debris. Train stations still have MAXX branding despite that being discontinued almost a decade ago. 50 means 60 to the majority of motorists out here, so roads are especially freaky for other modes or for children and other vulnerable road users. Enforcement is minimal apart from a couple speed cameras where everyone knows they are there and slows down for a few seconds before returning to 60. Some fantastic bike infrastructure out here, but most of it is over a decade old and was meant to be connected up to other things with a tranche of new bike infrastructure stuff that was due by 2015 but forgotten about due to the super city. I mean the list just goes on, cycling is the only thing that really works for me anymore after having my face smashed in at the train station. Sorry to hear that, Peter. Whether it the political representatives or the general population, this just confirms that the other side of the bridge thinks very differently to the southern side. That entitled privilege that accompanies the motor car, and the forgetting that one has become a slave to oil companies and vehicle manufacturers. And like most national MPs, completely disconnected from reality. Where a road is only wide enough for a single transit lane (especially where lanes in both directions would preclude addition of cycle lanes); I would like to see a central lane installed that could be used in one direction in the morning and in the other direction in the afternoon. This would likely require some refuge infrastructure at stops. Has anyone got any comments on the feasibility of this or examples of them in operation? Whangaparaoa Road had a trial exactly like this start in January 2018 and was to run for one year. If you check the project updates on the right of the page, it seems to have been considered a success. It would be good if they could update that page, and tell us what they measured, and what their conclusions were. Have a read for the gory details and subsequent discussion! A good pic too of a bus stuck in the Birkenhead Ave congestion, which is exactly what the T3 lane is going to alleviate. I was anxious to counter Dan’s relentless and ill-informed campaign lobbying against the T3. Despite good transportation practice being drawn to his attention, he chooses to ignore it in favour of political grandstanding. And don’t think his campaign against AT is going to stop there. Next step is to insist on a trial weakening of the Onewa Rd T3 down to a T2. A brain-dead suggestion if ever I heard one. He just doesn’t get the concept that we need to prioritise HOVs if we’re to encourage mode-shift to solve Auckland’s congestion problems. The need to maximise the number of people moved in a transport corridor rather than cars has escaped him. Extraordinary for a tertiary-qualified MP, so clearly politically motivated. I’d really like AT to step up here. Dan is on the attack making AT out to be fools who don’t listen to him or public opinion. Go in to bat, AT. Give us easily digestible facts and reasoning, and whatever you do, don’t capitulate. Agree with Steve. The Onewa Rd T3 has been under constant attack for the last few years – Dan Bidois has just picked up the topic where Jonathan Coleman left it. AT have consistently failed to communicate their logic, especially around the extension of the T3 from 9.30am to 10am, their reluctance to have a clearway and now the Birkenhead Ave T3. Their silence means the frustrated motorists fall for the loud populist voices in our community. What does their communications team actually do? Steve, what happens if they go to a T2 from a T3? I don’t know, but what does the evidence say for traffic volumes at the level of this road? I was thinking it might still be a useful upgrade from just parked cars! – The T3 lane arrangement is more than 10% more efficient than if a T2 lane were to in place. The T3 lane provides higher overall travel time benefits to customers, and enables increasing overall travel time benefits for customers today and going forward. So in essence there are so many buses/people using the transit lane that the T3 is fully justified. Stepping back to a T2 would mean more cars slowing the buses and reducing the attractiveness of PT for current and future passengers. I just wish AT would use their comms team to get this information out into the public forums rather than tucking it away in dusty local board papers that rarely see the light of day. Thanks for your input here, Steve. If you haven’t done already, can you email the communications team at AT and ask them to do just that? Maybe the customer experience team, too? I have no idea how their systems work, but sometimes I am surprised by how well they take on a new task. Even though this guy is kicking up a campaign against this. It probably won’t get much opposition as it’s so small yet these small little improvements can make a surprising difference to the general public transport experience. Keep on picking away at these AT. Matt, our of interest have you gone to Birkenhead Ave at peak hour to make your own assessment of how well the T3 will work, and how it impacts all road users? Or are you just going off the AT information? I agree with Steve. Living in the area my perception is that the local MP is grandstanding. Putting AT in a bad light on this issue serves that purpose so well; whilst offering no well researched solution. Bidois is very adept in using social media and his campaign appears on my Facebook timeline as ‘Sponsored’. This means someone is paying Facebook for it. Seeing that London and parts of New York have gone to congestion charging, I do wonder whether this could be helpful in partially solving some of the grid lock issues we see each day; no matter how unpalatable it is politically. How do you fit a dynamic lane on Onewa Rd Kelvin. It’s 2 lanes either way. Surely for a dynamic you need an odd number of lanes as a starting point. If advocating for 1xxTransit and 2x general vehicle lanes then what happens at the single general vehicle lane on-ramp? GAH wonders about a flyover at Sylvan. I don’t think it would gain much. Sylvan phase is 21secs fixed in (from memory) a 160s cycle and the only other competing demand is the motorway “U turn”. I think the bigger delay in the lower part of Onewa is the lane changing from T3 to city bound on ramp lane. One consideration about the dynamic lane concept – even though I do like to consider them – is that optimising capacity while all the modes are not provided for is counterproductive. Once Skypath is built, there will be demand for a cycle lane, so that will need to be accommodated too. It’s important that no extra car dependency has been developed by then, so that road reallocation is easier politically. All of which makes the staging of improvements here tricky. no there won’t be a demand for a cycle lane. Lake Rd cycle way links towards Northcote and otherwise cyclist should be put through Little Shoal Bay to Birkenhead. Very few kids cycle to school so it’d be hard to justify cost. AT’s Roads and Streets Framework shows that cycling needs more routes for cycling than for driving. That’s what filtered permeability means. Let the people using sustainable modes through but be careful where the space-inefficient cars can go. You can’t get to amenities along Onewa Rd by cycling unless you cycle on Onewa Rd. So I’m afraid neither Lake Rd nor Little Shoal Bay quite cut it. The cost of keeping people safe when they cycle is supposed to be borne by motorists, as they are the ones presenting the danger. And kids don’t cycle to school because it’s not safe enough. My point is that those accessing amenities on Onewa Rd aren’t Skypath users. How do you know the people accessing amenities on Onewa Rd aren’t skypath users? Are the people driving to amenities on Onewa Rd not harbour bridge users? As for what a middle aged man thinks is uncool for kids, we can safely say it’s the opposite! lol. this middle aged man likes to cycle. Therefore by your argument cycling for kids is uncool. What I’m trying to say is the reason for not cycling to school is alot more complex than just safety. Skypath is a north-south connector. Onewa Rd is an east-west. If a cycleway from Birkenhead to Skypath was put through Little Shoal Bay instead then Onewa Rd is only going to act as a collector. The Little Shoal Bay route could link to the Birkenhead Ferry terminal and the beach and is a far more picturesque, less concrete jungle route. If they could put it through the bush between Onewa Rd and Hinemoa St it could be utterly awesome. Anyway, just the opinion of a middle aged man. I’m old enough to have learnt that I don’t know everything. “What I’m trying to say is the reason for not cycling to school is alot more complex than just safety.” – Having grown u in a city where everyone cycled (Christchurch) that is just not true. In the early ’90s, as soon as cycle helmets came in with the suggestion that cycling was an unsafe activity, the number of bikes plummetted. There was no suggestion by any of my freids that cycling was uncool. We all continued to do it on the weekends as much as possible. You only need to look at countries/cities where it has been made safe to see the effect. You are talking from a very narrow view point that doesn’t hold up to any scrutiny. I’m just thinking of the conversation I’m going to have with my teen. Hey son would you like to cycle home or come home on the bus playing on your phone. Trying to get my son to give up screen time is like trying to convince him to eat Brussel Sprouts. Why the refusal to consider that there might be other factors in play for a mode change? What’s the problem with opening that conversation? If it turns out that safety is the absolute key then build it and they will come. I just want to avoid another Birkenhead Wharf Bike Shed outcome. I think this is backwards. Cycling should be safe. Period. Only when it’s safe everywhere will be able to see what people’s preferences are. We’ve underspent on walking and cycling for 60 years, so it’s going to cost a bit to fix everything up. But we must do it. And the cost must be met by motorists. Even the Neolib bible on transport policy: The Future Funding Strategy, claims that cyclists have a right to be safe, and that the cost of providing the necessary infrastructure should be met by motorists. I appreciate your jocular response to the age stuff… 🙂 Of course it’s all complex, but I think what young people can try to reteach us is how to have a vision of a better world. Other cities have turned car dependency around and created a cycling-friendly city. We can do that too. But we have to give up the space for it. You have to take the terrain into consideration. There are cliffs on both sides on Little Shoal Bay. And that bush sits in a deep gully so we would have to build that entirely as a bridge. Onewa Road is where it is because that’s where you can smoothly climb up from sea level (elevation: 0m) to Highbury (elevation: 85m). And that will be how you cycle from Skypath to Birkenhead. There’s only a steep hill on one side of the beach. If you discount the climb from the Pop Inn dairy to Onewa from the Maritime hill then the only extra climb is from the end of the 30kmh zone to Wakanui – the rest is an uphill gradient similar to Onewa. With the existing road widths on Hinemoa / Maritime / Rodney I’d guess it would be easier to achieve. I may potentially cycle Skypath daily. Even if they build a cycleway on Onewa, I’ll probably go Little Shoal Bay just because it’s a nicer route. – Cycling from anywhere along Onewa Road to either Highbury or Skypath. Or to Northcote. Any sensible bicycle network must include that street. Of course they aren’t SkyPath users; nobody is cos it doesn’t exist! This would give you a huge bias in your opinion now on favoring walking for school kids. 😉 What if this good looking girl rode a bike back then?